Police have identified the victims in a fatal Northeast Philadelphia crash. BUSTLETON (WPVI) -- Police have identified the three people killed and two injured in a crash in Northeast Philadelphia late Wednesday night. According to authorities, a 2007 Acura split in two after slamming into a tree around 11:40 p.m. on Sandmeyer Lane off of Red Lion Road in the Bustleton section of Philadelphia. Sabrina Rhoads and Yvette Gonzalez of Philadelphia, both 17, were ejected from the vehicle and pronounced dead at the scene. 20-year-old Felipe Hernandez of Medford, NJ was trapped in the vehicle and died at the scene. 17-year-old Bagdon Arutyunov of Philadelphia was found on the roadway with severe head trauma and other injuries. He was rushed to Jefferson University Hospital where he remains in critical condition. Police say the driver, identified as 20-year-old Christopher Bloomfield of Philadelphia, walked away from the crash, and may have been picked up by the occupants of another vehicle at that crash site. Police say he ended up at the hospital by 4 a.m. and is cooperating. Investigators say they haven't gotten much information from him, saying he was traumatized and didn't remember much about the crash. There was no evidence of drug or alcohol use. Action News spoke with Sabrina Rhoads' aunt, Karen Lee, who is in disbelief. "It just doesn't feel real, still doesn't feel real to me," said Lee. Rhoads was a senior at George Washington High School. "I'm still trying to get my family through this and deal with this on my own as well. I just pray for all the families, all the victims, everybody that knew anybody who was involved in this," Lee said. Ron Bordone left a bouquet of flowers at makeshift memorial Thursday night in memory of Yvette Gonzalez. Gonzalez's mom works at Bordone's restaurant. He says he just saw the teen over the weekend. "Very nice girl, outgoing, I met her three or four times she came to visit her mom at the counter. I saw her on Sunday," Bordone said. Action News also spoke with Arutyunov's close friends who went to the hospital to see him. "Just knowing that he was a part of this is just heartbreaking," friend Allan Kantor said. 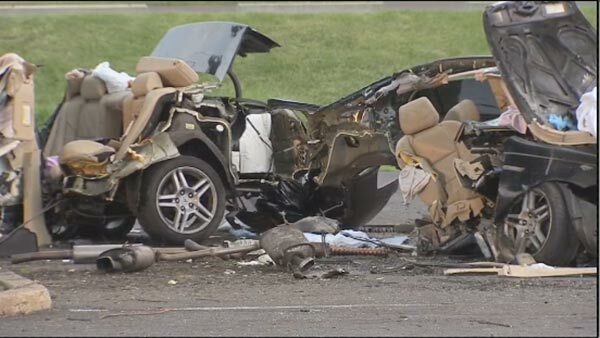 Police investigated a deadly high-speed crash in Northeast Philadelphia they say was likely the result of drag racing. Police say the Acura was one of two vehicles that were seen on surveillance video going at a high rate of speed before the crash. Investigators said on Thursday afternoon they want to talk to the people in the other car. "The people in the other car, we want to talk to them. They have a responsibility to give us some information about what they saw, because they did see the crash," said Captain John Wilczynski. Police wouldn't definitively say if the cars were racing. "They were both going fast, they were both going at a fast speed. I don't know if they were exactly racing, but they were certainly going fast," said Wilczynski. "Too fast for the conditions and too fast for the roadway." Police do not yet have a description of the car being sought. Wilczynski said it's estimated the cars were going over 75 mph. Business owners say it is very common to see cars speeding on that road, especially through that curve. We're also told this isn't the first time that tree has been hit.